Recorded as Ambridge, Hambridge, Hambrick, Hambrook, Hanbridge, Hanbidge, Hanbrook and possibly others, this is an English locational surname. 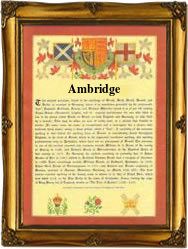 There does not seen to be or have been a place called Ambridge, this surname probably originates from either Hambridge, a village in Somerset, or Ham Bridge, a village in Sussex, or the four places called Hambrook in the counties of Gloucestershire (twice), Hereford or Sussex. The places as Ham Bridge translate as 'stone bridge' from the pre 7th century Olde English word 'han' meaning stone, and 'brygg', a causeway, or Ham Brook, the stony stream, with Hambrook in Gloucestershire being recorded as 'Hanbroc' in the famous Domesday Book of 1086. The transposition of 'n' to 'm' as in han to ham, is a common feature of early recordings, and may be put down to either poor spelling or thick dialects, or probably both. Locational surnames are by their nature 'from' names. They were names given to people as easy identification, after they left their original homes to move somewhere else. In so doing they took or were given as their surname the name of their former village. In this case the surname in its different forms is well recorded in the diocese of Greater London, the 'mecca' then as now, for those hoping to make their fortune. Examples of the surname recording taken from surviving church registers of the city of London include Susanna Hanbidge, at the church of St Brides Fleet Street, on December 7th 1632, Paul Hambrooke at St Pauls Covent Garden, on February 14th 1664, Elizabeth Ambridge who maried Franciscus Norris, at St Martins in the Field, Westminster, on January 2nd 1667, and Joseph Hambrick at St Dunstans in the East, Stepney, on August 5th 1868.